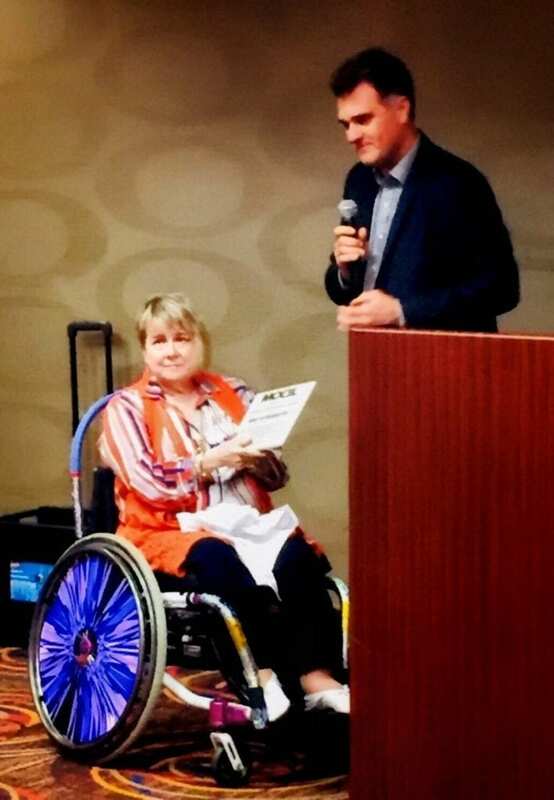 On September 24, 2018, Miki Gudermuth, the executive director of SADI, was given a Lifetime Achievement Award from MOCIL (Missouri Centers for Independent Living). In 1948, Maryann “Miki” Gudermuth contracted polio. She was 9 months old at the time. In addition to having polio she suffered from malnutrition and abuse from her stepfather so Miki was removed from her biological mother and placed in St. Anthony’s Hospital in St. Louis for her care. She was eventually adopted by a couple who heard about her situation. They provided a wonderful home for Miki filled with love and encouragement. The ravages of polio left Miki with a permanent disability. Most of her young life was spent at Shriner’s Hospital enduring multiple surgeries on her legs, hips, and feet so she could walk again. And even though she was in pain, she spent a lot of those days cheering up and comforting the younger children who were going through their own surgeries and pain. Miki did not grow up in a world with the luxury of curb cuts, automatic door openers or ramps. She grew up in a world full of steps and barriers. However, not being one to shy away from a challenge, Miki took on the role of advocate at an early age, standing up for herself and those who literally could not stand up at all. Miki was the Easter Seals Poster Child for March of Dimes in St. Louis. Miki became a part of the Independent Living Movement. She was a vocal supporter of civil rights and equal rights for everyone regardless of their physical or mental challenges. Miki and her husband moved to Cape Girardeau where she discovered there was not a local support group for polio survivors. So guess who organized a local support group for polio survivors? The meetings were held in Miki’s home and soon people with all types of disabilities began attending. Miki soon learned that, in addition to their disabilities, these people faced other local issues such as lack of affordable, accessible housing, lack of transportation, lack of employment and lack of healthcare. Miki saw the need went beyond support to a need for advocacy. Miki, along with five others with disabilities, formed and incorporated SEMO Alliance for Disability Independence, also known as SADI. It was a not for profit organization created to assist and advocate for people with disabilities in the community. Miki became known as the local spokesperson for disability rights and related issues. 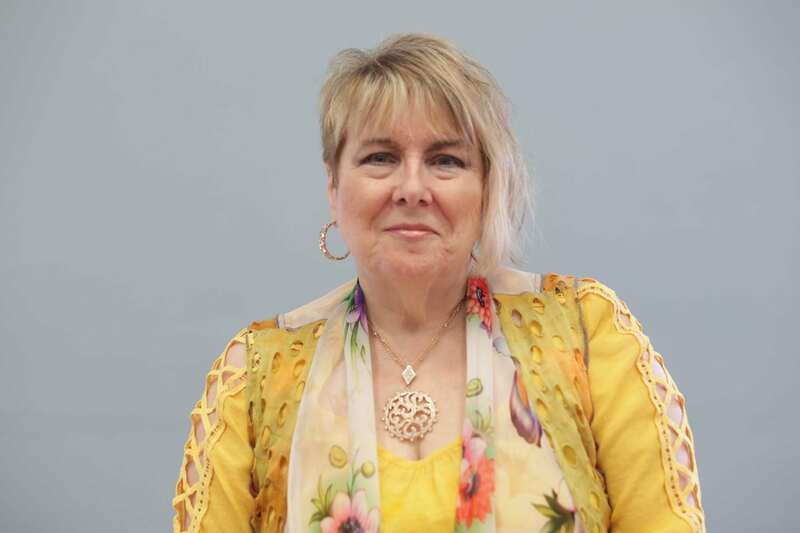 Miki was appointed to the Governor’s Council on Disabilities and became the local liaison on employment for the disabled in southeast Missouri. That same year, Miki also began serving a two year term on the Mental Health Advisory Board in Jefferson City and worked closely with Missouri Protection and Advocacy organization. Miki began serving on the State Independent Living Council of Missouri. Miki began serving on the Board of Directors of Easter Seals. Finally after seven long years developing the groundwork, building relationships, and getting community support, SADI was funded and approved by Governor Mel Carnahan, as the 7th non-residential center for independent living in the state. Miki was appointed to the Missouri Assistive Technology Project to study and assess assistive technology needs in southeast Missouri. Miki received the Easter Seals Society Award for Personal Achievement for all her advocacy work and accomplishments. Miki started the first epilepsy support group in southeast Missouri. Miki took on the local sheltered workshops and advocated on behalf of those who worked in them. She worked with and supported the Perry County Commission when they elected to pull away from the local workshops and become the Independent Perry County Sheltered Workshop where they offered competitive wages and better working conditions. Miki was successful in starting transportation services through SADI to benefit the disabled population, getting to and from work. This transportation gave the disabled more employment options, other than the sheltered workshops. Miki served on the Board of Directors for Support Dogs Incorporated in Jefferson City. She also helped raise money to fund dogs for those who could not afford them. Miki was the recipient of the Zonta Woman of Achievement Award. Miki worked with local individuals who wanted to start a chapter of ARC in southeast Missouri. Miki acted as a consultant and offered to finance the cost of the startup fees. Miki was instrumental in providing technical assistance and language to clarify the roles of the local Senate Bill 40 board in Cape Girardeau County. Miki received: the Kiwanis International Walter Zoellner Women in Leadership Award, the St. Francis Medical Center Disability Leadership Award, and the Missouri Commission on Human Rights Disability Rights Awareness Award. Miki was the recipient of a Missouri Senate Resolution honoring her lifelong work as an advocate for the disabled. She also received a Lifetime Achievement Award from the Missouri State Independent Living Council for Advocacy and Leadership in Independent Living. These are just some of the awards and accomplishments Miki has achieved through the years. There are many more but the accolades are not why she continues to do what she does. Miki is a true advocate in every sense of the word. She gets it because she lives it. Every. Day. Miki will be retiring in June of 2019. She has been a wonderful mentor and teacher throughout the years to everyone who has worked at SADI. The center will continue to move forward, advocating for those who are often overlooked, offering services to enrich the lives of the elderly and persons with disabilities. That is how Miki’s legacy and her work will live on.